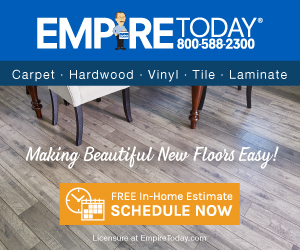 Our mission is to “Make beautiful new floors easy,” for our nationwide customers. At our core are the values of respect, integrity, teamwork, “customers first,” and the quality results that our brand commands. We appreciate you making us aware of this matter. We’ll be following up with you soon to discuss your concerns further and start working towards a solution. Empire did a beautiful job installing the carpet but did a hideous job on the metal trim at the doorways and refused to correct the install. They offer one year installation workmanship warranty but don't stand behind it. Would not recommend Empire to anyone. They don't return phone calls to people that place complaints with them. I have called numerous times and have spoken to many different people yet nobody wants to help correct this situation. The installers should include on their team someone who has the knowledge of installing metal trim at the doorways since every house has interior doorways. Completely unprofessional trim work. Product or Service Mentioned: Empire Today Warranty. Preferred solution: Fix all of the trim. Review #1050500 is a subjective opinion of User1050500.